Artwork is a tribute to the men of Brunswick and district who served with the 10th Light Horse Regiment during World War One. 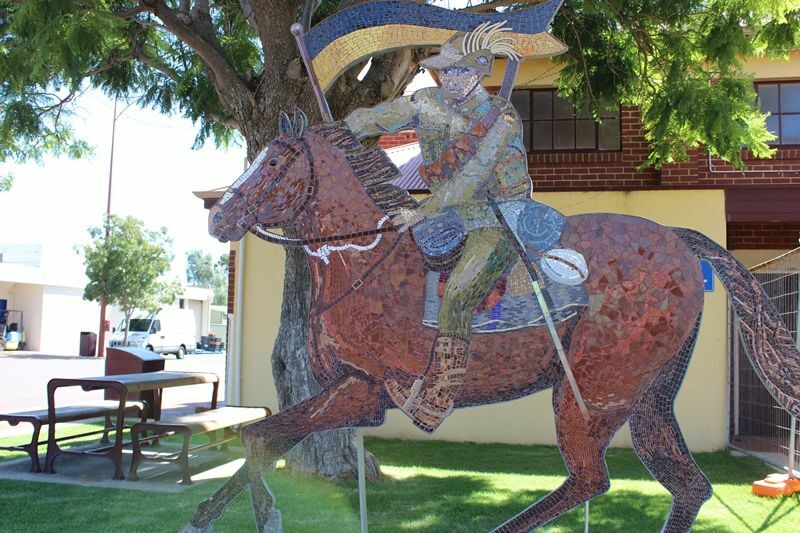 THIS DEPICTION OF A MOUNTED LIGHT HORSE TROOPER ON THE CHARGE IS A TRIBUTE TO THE MANY YOUNG MEN OF BRUNSWICK AND SURROUNDING DISTRICTS WHO SELFLESSLY GAVE THEIR TIME AND ENERGY, AT A TIME WHEN LIBERTY AND FREEDOM WERE THREATENED, IN THE SERVICE OF THEIR COMMUNITY AND COUNTRY. IT WAS COMMISSIONED BY THE LIONS CLUB OF BRUNSWICK JUNCTION WITH THE GENEROUS ASSISTANCE OF (TROOPER) ROGER EDWARDS, THE DEPARTMENT OF VETERANS` AFFAIRS AND OTHER LOCAL DONORS. BUNBURY ARTIST ROCHEEN NAVARRO DESIGNED AND CONSTRUCTED THE ARTWORK WITH THE ASSISTANCE OF LIONS CLUB MEMBERS. IT WAS UNVEILED BY ROGER EDWARDS (AGED 92 YEARS) ON 26TH MAY, 2013.